Ahmadiyya Muslims, regarded non-Muslims by Pakistan, hope to overcome hatred they face across the world by funding good causes in East London with money donated by Ahmadis across the UK.Speaking at the walk’s launch dinner, which 85 charity representatives and Stephen Timms MP attended, Ahmadiyya Muslim Elders Association president Dr Ijaz Ur Rehman said the scheme was part of his community’s mission to serve humanity. The launch dinner, which was held at Empire Venue in Barking Road on Friday last week, was attended by about 200 people keen to pledge support for the circular walk, which began at 1000 Dockside today at 10am.The annual walk, which is in its 28th year, invites people to raise money for a charity, with the Ahmadiyya Muslim Association aiming to match what walkers raise. Charities involved this year include Beckton’s Richard House Children’s Hospice and East London charity Saint Francis Hospice.Basharat Ahmad, leader of the Newham Ahmadis, said about 2,000 walkers are expected, with this year’s fundraising target set at £500,000.“We’ve hosted this walk up and down the UK but this is our first year in Newham,” he said. “We want to show the community we’re doing work for good causes and not just religion. 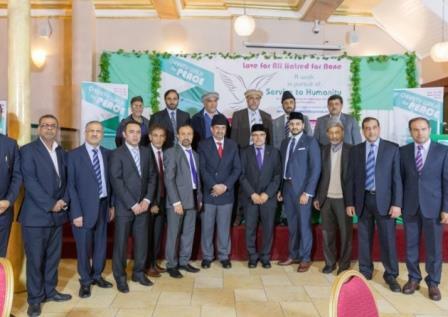 Share the post "Ahmadiyya Muslims pledge up to £365,000 for charity in Newham walk"